Good day, all! I had a question about my nib. I have a Duofold International that I bought new about 1992 or so. It is blue marble and has a nib with the arrow pointing toward the tip. When I unscrew the nib to replace the cartridge, it does not look like pictures of nibs like mine I see online. In pictures, the nib has a gold band at the rear, and a gold colored metal collar with metal threads on it. My nib section is black, no gold collar, and the threads are plastic. I am noticing a gold band on the end of the barrel (where the nib screws into) and what looks like metal inside the barrel connected to the gold band. On my nib, the plastic tip that fits into the cartridge is totally exposed. I am wondering if the metal part of the nib unscrewed from the black plastic part of the nib and is now stuck inside my barrel? If so, any simple ways to remove it? Hard to get a grip on the gold ring as it is relatively thin. Thoughts? Does your International look like this? 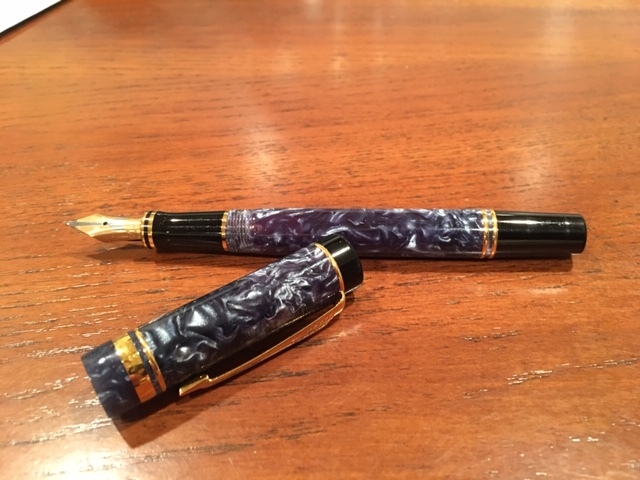 BTW, is that a Pelikan Grand Place in your picture? Also, it would be handy if you posted a picure of your International that shows the problem areas you're talking about. Edited by RoyalBear, 11 February 2019 - 23:55. ]Here is my pen. Perhaps the metal collar around the rear of the nib assembly separated? Edited by phillaf, 12 February 2019 - 01:53. Yes the metal part in the barrel should have stayed on the pen section instead of being in the barrel. A bit of rubber bike tire or such should give you enough grip to get it to thread out of the barrel. Well, Thank you. I didn't want to twist the thing and risk cracking the barrel if it was supposed to be like this. 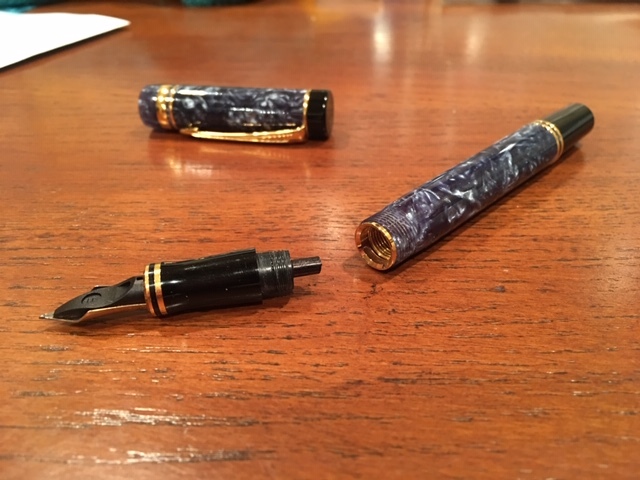 I've had the pen out of service for a while and couldn't remember if this was the way it was supposed to be or if it had separated. I think I can get it out with a piece of rubber like you recommended. Thanks again!